Seagreens are range of food products made entirely from seaweed with nothing added or extracted. Unlike conventional Vitamin and Mineral supplements, Seagreens® are a pure, natural wholefood containing all the nutrients and micro-nutrients needed to enable the body to assimilate all the goodness present. 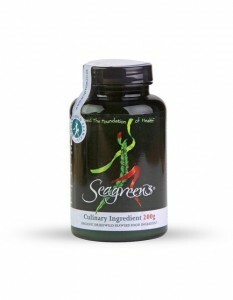 Seagreens® are available in capsule form, or as a range of culinary food products. Why is Seagreens® Seaweed So Good? Seagreens® are a wild, pure wholefood, unlike other dietary supplements which are artificially extracted, contain fillers and binders and don’t contain the necessary trace elements and combinations of nutrients to ensure bio-availability. Seagreens® are a blend of shallow water seaweeds (the opposite of, for example, deep water kelp) and don’t have excessive iodine content, so they can be taken regularly or in larger quantities to tackle specific health conditions. Seagreens® seaweed is wild harvested, sustainably, from the crystal clear waters of the Outer Hebrides. Only fresh, living wild plants are harvested, cleaned, air-dried and immediately cracked, milled, micronised or puréed to produce a range of convenient, digestible forms. Nothing is extracted or added. There is no root or floating seaweed, no sand or other extraneous material. Seagreens® are the product of sustainable, year-round harvesting among the beautiful islands of the Outer Hebrides in Scotland. Here – from the richest nutrient deposit on Earth which feeds thousands of marine species – we choose the shallow water Wrack seaweeds for their outstanding breadth and balance of nutrients, to bring you a natural whole food of the highest quality and value. Bladderwrack, caragheen, dulse and dabberlocks; murlin, thongweed and sea tangle – their names picture a different world, a gigantic vegetable garden beneath the sea. We cut our wild seaweeds in crystal clear waters so they continue to grow. We harvest only nutritious, living plants – no drifting, beached or root seaweed, no sand or crustacea. For freshness we mill them on the spot! Pure seaweeds with nothing added and nothing taken away. Available in Food Capsules, Food Granules, Iodine+Capsules, Salad & Condiment, Culinary Ingredient, The Mineral Salt, Glass Shaker, Organic Micro Granules, The Mineral Bath, Pet Granules.